Early and aggressive resection of low-grade gliomas (LGGs) leads to increased overall patient survival, decreased malignant progression, and better seizure control. This case series describes the authors’ approach to achieving optimal neurological and surgical outcomes in patients referred by outside neurosurgeons for stereotactic biopsy of tumors believed to be complex or a high surgical risk, due to their diffuse nature on neuroimaging and their obvious infiltration of functional cortex. Low-grade gliomas account for approximately 15% of all primary brain and CNS tumors in adults. These gliomas are classified based on histology and include WHO Grade I and II gliomas. Grade II gliomas present their own set of therapeutic challenges and will be discussed further. The most common subtypes of Grade II gliomas are astrocytoma, oligodendroglioma, and oligoastrocytoma. The majority of adults with these tumors are diagnosed between the ages of 20 and 64 years, with a median age of 39 years, and the diagnosis is frequently made among otherwise healthy and productive people. Although LGGs are more histologically and radiographically benign than their high-grade counterparts, many patients eventually die of their disease due to tumor progression and/or malignant transformation. The average overall survival for patients with LGGs is approximately 6 years, but up to one-fourth of patients live 20 years after diagnosis, which emphasizes the importance of maintaining patient quality of life when intervening. 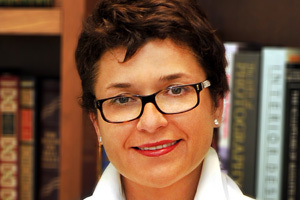 Lucia Zamorano MD – Clinical Professor of Neurological Surgery. Oakland University William Beaumont School of Medicine. Read More.